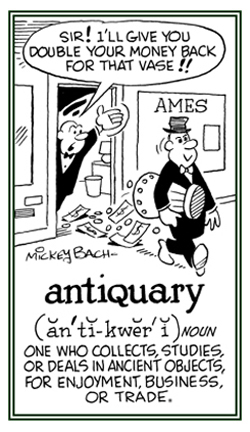 Someone who collects, is knowledgeable about, deals in, or studies ancient works of art, or other items which are usually of great value because of their age and scarcity: Garrett was considered to be quite an antiquary of old and rare objects and books. © ALL rights are reserved. 1. A solid bony branched horn found in pairs on the head of an animal, especially a male, of the deer family, including caribou and elk. Antlers are shed each year. 2. Etymology: from Anglo-French auntiler, from Old French antoillier; possibly from Vulgar Latin anteoculare; literally, "horn growing before the eyes" ("in front of the eyes") from Latin ante, "before" + ocularis, "of the eyes". Showing page 6 out of 7 pages of 92 main-word entries or main-word-entry groups.